Well, I did promise. 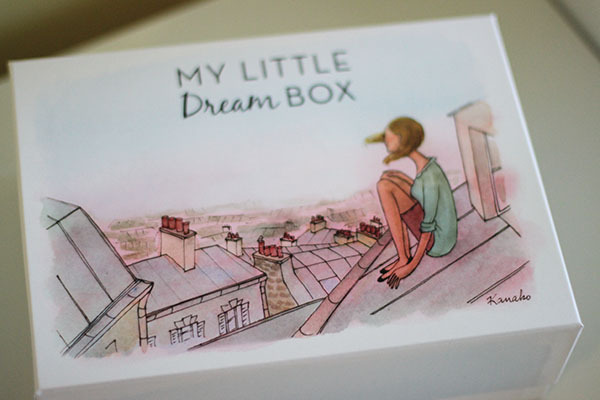 Just yesterday, the next installment of 'My Little Box' arrived on my doorstep - and here, the very next day, is my post. So, last month, I was pretty damn pleased with the box. (To be clear, it was last month's box - I appreciate I only did the review two days ago.) Could this month beat it? Well, in short, yes. 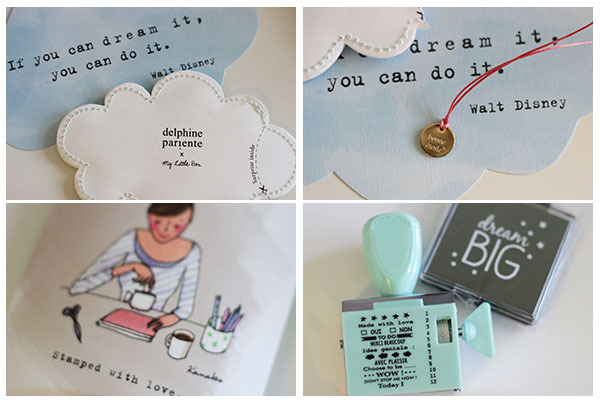 The theme this month is 'Dream' and that was always going to be a winner with me; I love my sleep. In my opinion, there's just nothing better than an early night. Obviously, this is post children - I used to love lie-ins, but that's not really something that happens anymore, so the only option to get my sleep is to head up to bed nice and early. I love it. 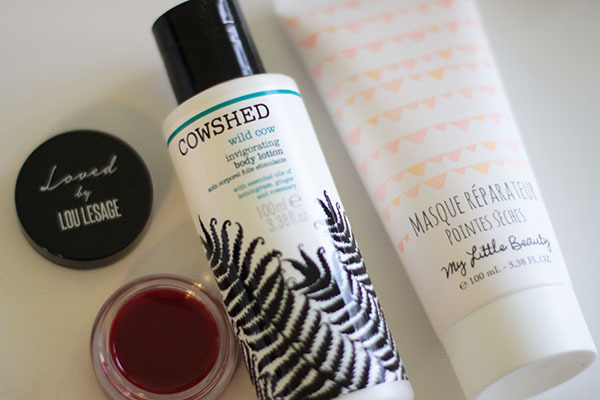 Beauty products first - and it's a goodie. My Little Beauty Repairing Mask for Dry Ends - well, who doesn't need to give their hair just a little bit more love and attention? A mask with walnut oil and shea butter, I'm looking forward to giving this a whirl. Rinsing with cold water? Not so much. It's the price we pay. Lip Balm Loved By Lou Lesage - basically, a tinted lip balm. This is inspired by Lou Lesage - I've never heard of her, but apparently she's a French actress that looks like a babydoll and a rockstar simultaneously. Must be quite a woman. Either way, this looks pretty decent to me. 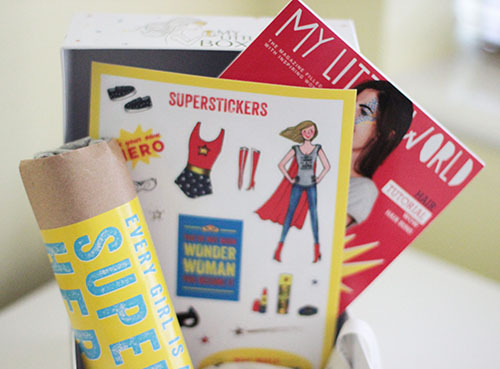 My Little Box always features a 'lifestyle' product; this month we got two treats. And finally, a stamp. Sounds ridiculous, but this is quite cool - it has 12 'messages' (some are very chic and in French) - but basically, they will spruce up any post or notes I make. It's on my desk as we speak. So, all in all, another winner from MLB. You can sign up for yours here; it's £14.95 per month including p&p. Yes, it's late. Sorry about that. But this month (or, in fact last month - but let's not get bogged down in detail), My LittleBox has 'knocked it out of the park' (one for our American friends). This box contains fewer products, but much better ones in my opinion. Even the kids got a treat this month; those wonder woman stickers lasted about five seconds with the two girls, but they got way more pleasure from them that I would. I'm not sure what you'd do with them if you don't have kids - but maybe I'm just not cool enough? Stick them on your school books maybe? Who knows. I'd recommend giving them to someone with kids. It might look odd if you just randomly give them to a child you don't even loosely know. In the last couple of boxes, we've had a pretty cheap looking sports bag (not yet been used) and a smart phone case that didn't fit my smart phone (so went in the bin). This month though - drum roll, please - a winner has been found. Hurrah. A Gat Rimon t-shirt - 100% cotton - that says 'I believe I can fly' (thank you R Kelly - ahh, the memories of the 90s). I think it only comes in one size though, so it's not going to be for everyone. I haven't photographed the t-shirt yet (apols) but it's rolled up in that brown roll in the photo above. Picture a grey crew neck t-shirt and you're pretty much there. I'll instagram a photo when I wear it. 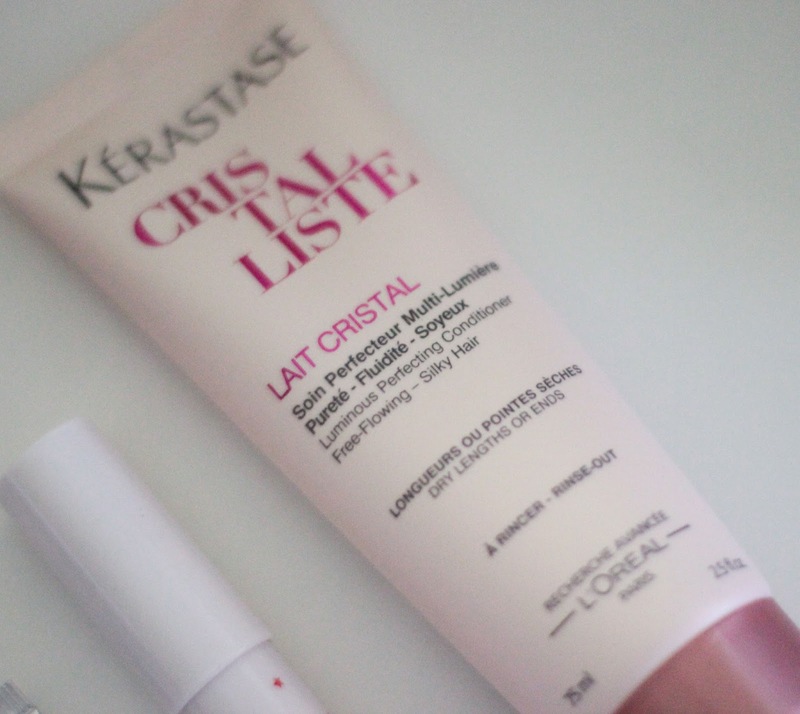 Three products this month: Caudalie's Hand and Nail cream (a favourite already), Lait Cristal by Kerastase and Pencil Bluff by My Little Beauty. I don't need to say much about the hand cream; I love it, I already use it, it's brilliant. It's not full size is about the only complaint I have (which, admittedly, is a bit unfair) - but it's still 30ml, so a good handbag size. Winner. 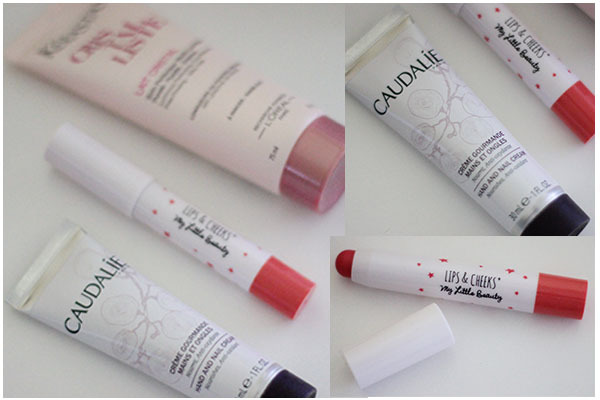 I'm still in two minds about the My Little Beauty products - they are good quality, but the colours aren't great for me. This little number, though, should be okay in the summer. For me, it will definitely be more of a cheek thing and less of a lip thing - but you can't complain at multi purpose products. I wouldn't buy it, but it's nice enough. Without doubt, you cannot go wrong with any Kerastase product and I'm looking forward to trying this one. This is a lightweight conditioner that claims to leave hair looking luminous, soft and supple. I'll be the judge of that, but I'll let you know. But I have high hopes. Also, I'd recommend checking out the postcard that accompanies the products; this month you also get 20% off Caudalie's products on their website and 20% off Kerastase one's on theirs. Definitely worth making the most of. Overall, this is the best box I've had yet - so I'm looking forward to the next one. And I promise the review won't be late next time. 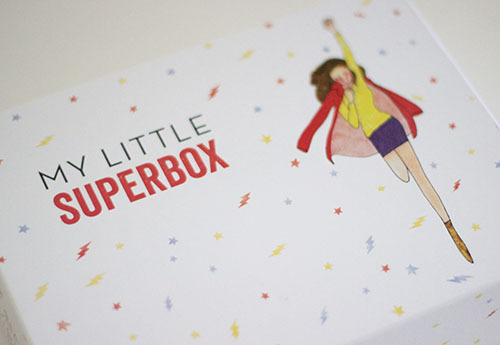 You can sign up for My Little Box subscriptions here; it costs £11 per month, plus £3.95 p&p. I'm a regular of the 5:2 'diet' (it's not really a diet), but my 5 days have been a little bit indulgent of late. And, Easter has made it pretty difficult to pass on the chocolate. 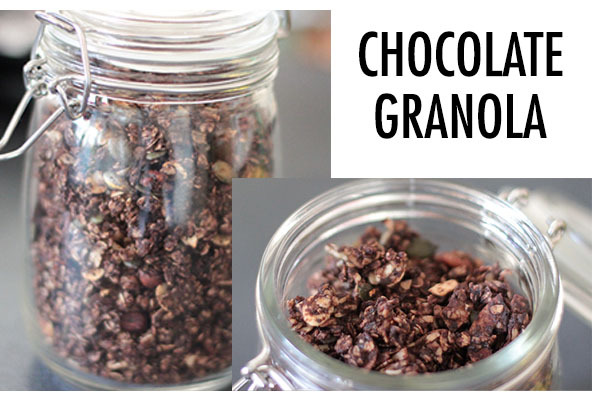 This isn't the healthiest granola you're ever going to see, but at least you know what's in it, and it's a cinch to make. Plus, it makes the kitchen smell fantastic. Me, domestic goddess? But of course. Even - and this is a bit win - eldest Martini quite likes this - he feels it's a bit like chocolate porridge. Sort of. The 'chocolate' is a mix of cocoa powder and nutella. Obviously. Nutella truly is the food of the gods. Coming from the wife of a French Canadian, I (of course) use maple syrup to sweeten the granola. Honey would probably work just as well, but I haven't tried it. Get the lightest (in colour) one you can - the lighter the colour, the better the quality. Oh, and make sure it's actually made from maples - apparently, its completely legal to mix it with all sorts of other things and still call it 'maple'. We got ours (we have quite the stash) the last time we were in Quebec, but this one will be just fine. Anyway, if you're feeling that you can't quite give up the chocolate just yet, but you're looking in the mirror and thinking 'hmmm. Really should sort that out soon...' then this won't do you any harm. Only warning: you may eat the whole batch in one sitting. Which sort of defeats the point. But, I guess you can always start again tomorrow... Enjoy. - Preheat the oven to 170 (or 160 for fan-assisted). Line a large baking sheet with baking parchment or a silicon mat. - In a saucepan, melt together the coconut oil, maple syrup, cocoa powder and nutella over a low heat. Keep stirring until it's liquid gold. Try to resist eating with a spoon. - Mix together all the dry ingredients. Don't be too worried about the amounts - apart from the oats - and if you don't like something, just leave it out and/or replace with something you prefer. Granola is pretty easy really. - Add the melted ingredients to the dry ingredients and mix well. Everything should be well coated - it takes longer than you think, so keep at it. - Tip the whole mixture onto the prepared baking tray and spread as thinly and evenly as possible. Put onto the middle shelf of the oven. - Cook for around 30 minutes, stirring a few times to make sure the top doesn't get burnt and the mix underneath is heated through. 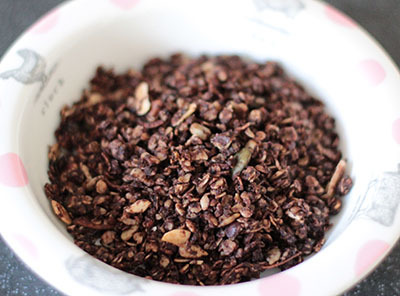 When you remove from the oven, leave to go cool without stirring - as it cools it will clump together, making for perfect granola! - Store in an airtight container - it will keep for at least three weeks. Serve with milk, yogurt, berries - or just eat straight from the jar with a spoon. I won't tell if you don't. 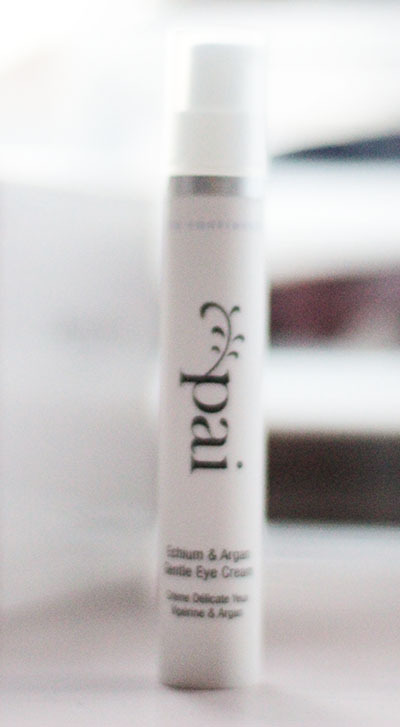 A Model Recommends is a big fan of Pai Skincare, and the eye cream in particular. My quest for a decent eye cream continues; for some reason my eyes seem to be really sensitive and water almost with the touch of any cream. So, I thought I'd give this one a try. First, some background on Pai Skincare: it's a British skincare company that produces products particularly with sensitive skin in mind. It's organic - obviously - and the company prides itself on being very clear what ingredients are in the bottle. It's been around since 2007 and all the products are manufactured in West London. I like the philosophy: how does the product stack up? 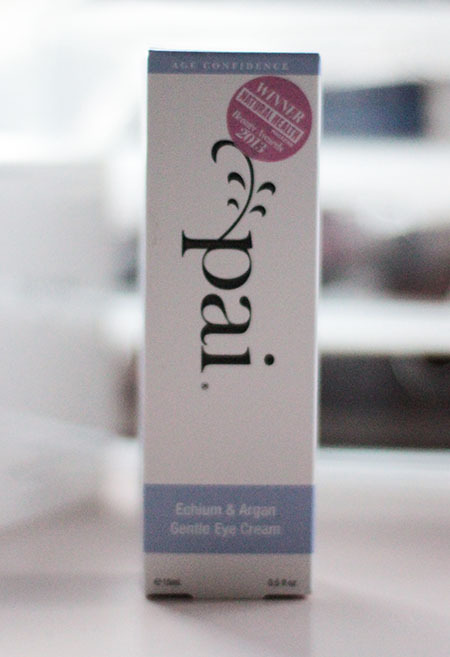 The echium and argan gentle eye cream is extremely light and hydrating. The website tells you 'it's rich in rare and incredibly effective forms of Omega 3 & 6 that smooth and soothe the delicate eye area'. Also it helps 'improve the appearance of fine lines, keeping skin soft, plump and beautifully supple' thanks to the linolenic and steridonic acids. I've been using this for more than a month and can confirm it does smooth and soothe the eye area - it's definitely helped with my dark circles too. The cream isn't scented and a little goes a long way. I use it under the eye and on the orbital bone - and I use it both in the morning and at night. The only issue I have is the packaging: it's impossible to tell when you're getting low on the cream and suddenly, one day, you just realise you've run out. That's not ideal if you're not the type of person that keeps back-ups. But, that's the only issue I have. This stuff is a pleasure to use and I'll definitely repurchase. It's £28 and you can buy it online here and here. Just recently, I've had a few breakouts that are far from ideal. I don't get that many spots, so when I do, I moan constantly. I did actually want to try the Origins Super Spot Remover but I couldn't find it anywhere quickly, so I popped into the Kiehl's at Waterloo station and picked this up instead. It's a salicylic acid treatment, well known for its blemish treating properties. Prepare for a slight sting when you apply it - personally, I quite like that, as it makes me feel something is really being done. The best thing is that it can be applied over make-up, so you can put it on throughout the day and it does offer relief to those really painful bumps under the skin. This doesn't produce results overnight; it takes two or three days to fully kick in. For me, that's how long spots tend to last anyway, so its difficult to know how effective this treatment really is. What it definitely does, though, is offer some pain relief, and given that it's a clear gel, it's far more usable during the day than my trusty Germolene. I'm going to make an online order of the Origins one, so I can do a comparison next time I need it. I'll keep you posted. 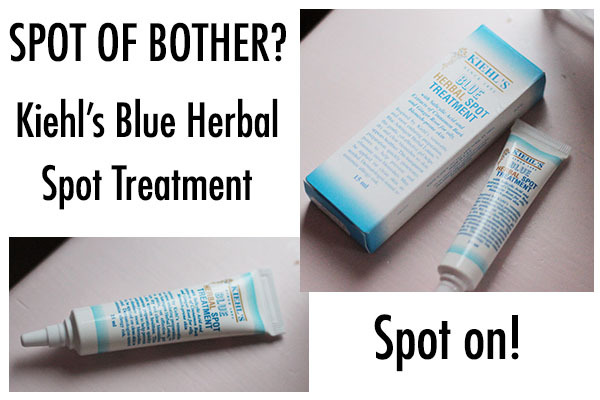 Kiehl's Blue Herbal Spot Treatment is £15 and available here. 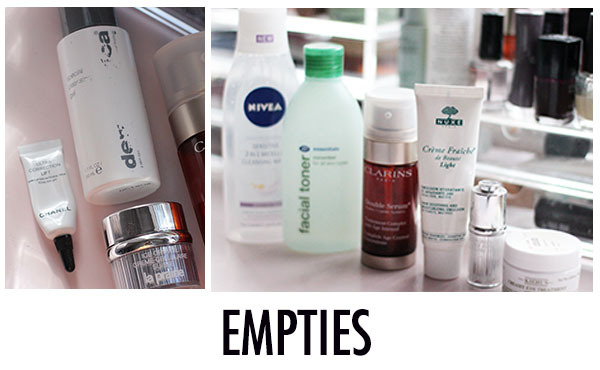 I've not done an 'empties' post before - and, being honest, I rarely drain product bottles dry of their contents before moving on to the next one. But, in the interests of my bank balance, I've decided to make sure I use things up properly (unless, obviously, they make my face fall off first). So, here's my first round up of products I've used ever last ounce of - and whether I'd repurchase or not. Dermalogica Special Cleansing Gel - a soap free, foaming gel cleanser. I haven't used a huge number of Dermalogica products, but the ones I have used I've been impressed with. This leaves the skin clean, without drying it out. It's gentle but effective. It doesn't replace my Liz Earle Cleanse and Polish (or Eve Lom, when I'm feeling flush) but it does the job. Repurchase? Probably in the future. But not right now. Chanel Ultra Correction Lift - an anti-wrinkle eye and lip product. As you can tell from the picture, it was a sample. Any good? Of course it was. It's Chanel. Unfortunately, I can't seem to find it for sale anywhere online, so that's the end of that. Probably for the best - for my wallet at least. Repurchase? I would if I could. But I can't. La Prairie Cellular Swiss Ice Crystal Eye Cream - another sample (obviously. I can't be spending £161 on eye cream. Well, not just now anyway). I absolutely love this range. Before you get ahead of yourselves, I was given some of these products (sample size only) by a good friend who's a regular user of this brand. Lucky her. This eye cream is brilliant - not quite as good as the dry oil - but a close second. Repurchase? Absolutely - when I get a pay rise, or win the lottery. Whichever comes first. Nivea Micellar Water - an absolute bargain at the moment (on offer for just £2 at Boots). Does what it says on the tin - removes make-up basically. You'll need a separate eye make-up remover though - it's not good enough for that. But, at £2, who can complain? Personally, I prefer the Garnier version, which I think is a bit better at tackling the eye make-up and that's usually on offer too. It's around £3. So not much preference really. Repurchase? Yes, if on offer and the Garnier one isn't. Boots Essential Cucumber Toner - claims to be refreshing and toning. For me, not so much. Cheap as chips (£1.50) but I'd say it's worth a little bit extra to get something with a bit more bang for your buck. I was sorely tempted to bin this before I got to the end. Be impressed with my self-restraint. Repurchase? A thousand times yes. Nuxe Creme Fraiche de Beaute Light - bought in France whilst on a 'pharmacie' splurge, just to check the French still had it. (They do, by the way.) I used this up, even though it was a bit light for the thick of winter - my skin has been ridiculously dry. This stuff is really light and hydrating - maybe not enough for winter, but I think it would be fantastic in the summer. It doesn't have SPF though, so you need to add that in to your routine. Repurchase? Yes, in the summer. La Prairie Cellular Swiss Ice Crystal Dry Oil - as per the above. This oil is amazing. It is the stuff of miracles. My skin has never looked so good. It's an oil, but it's not oily. It smells divine. Okay, it definitely should (it costs £213) but still. Every time I used it was absolute bliss. My skin has been suffering serious withdrawal symptoms. Which it will have to overcome for now. Another one to add to the list after that lottery win. Repurchase? Yes. If inspiration on numbers for the lottery strikes, do tell. Kiehl's Creamy Eye Treatment with Avacado - one of Kiehl's best sellers, and rightly so. This saved my eyes through winter. It's pretty heavy, so I used it as a night eye cream, but it did wonders - my under eye area is very dry, so I need something supercharged to sort that out. Repurchase? I'm thinking I'll be making space for this in October. 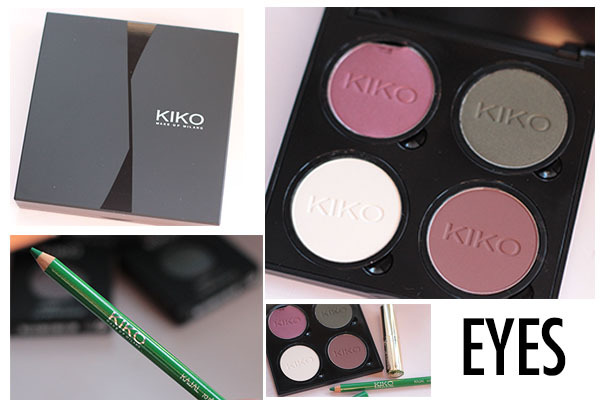 Kiko Milano is an Italian cosmetics brand that's been around since 1997. The price points of its products are entirely affordable, but cheap make-up this is not. The website claims that it has a range of 'cutting edge make-up' - and having mooched about the store on Regent Street for far longer than I should, I can concur that the range is innovative and just a little bit different. Naturally, you'd expect nothing less from a brand build on 'Made in Italy' values. I wanted to buy a lot more, but I restrained myself on this first visit. I was very keen on their Palette Clics System - very similar to Bobby Brown's Pan Palette system - although there isn't a mirror - but at a quarter of the price, you can forgive that. Especially right now, because it's all on half price offer - both the palettes and the eye shadows. At those sorts of prices, it would be rude not to. 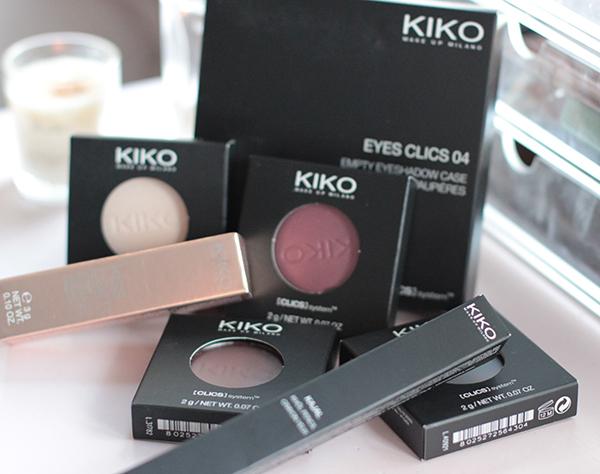 I bought the Eyes Clics 04 - there are four spaces for the eye shadows of your choice. £2.50. Bargain. I then opted for the following eye shadow shades: 201 Sparkling Silk (white); 233 Pearly Mahogany (pink/purple); 235 Mat Chocolate (brown) and Pearly Fern Green (green - obviously). Each one is currently on offer for £2,80. But don't be alarmed. If these don't float your boat, there are a whopping 88 shades to choose from. These shadows are highly pigmented and apply really easily. Although they definitely won't last the 12 hours they claim, they do last fairly well, especially with a primer underneath. The shadows pop into the Clics palette easily enough - there's a slight magnetic pull to keep it all in place, but it's not so strong you can't get them out again. I also picked up a green eyeliner - I recently heard that green eyeliner applied in the waterline help brighten the eye, and I wanted to try it out. It works a treat by the way - definitely give it a try. I opted for the Kajal pencil, specifically designed to go inside the waterline in the colour 112, Green Grass. It cost £4.20. I thought that was it for my first go, but on the way to the tills, this little lip balm beauty called out to me. 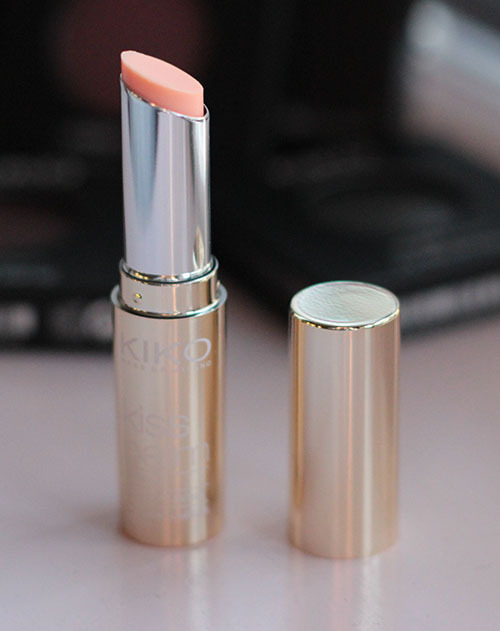 This balm is both hydrating and has SPF 15 - a winner just before spring arrives. I went for the coconut colour - obviously - but there are a variety of colours. The shea butter and vitamins are extremely moisturising and you can apply without a mirror. Even better, the packaging is brilliant. I really hate lip balms in little pots - you can apply this straight from the bullet without any mess or fuss. It looks a lot more expensive than the £5.90 it costs. I will be picking up a couple more colours shortly. Overall, this brand is definitely worth checking out - the sheer range is phenomenal. Even the most fussy of people would find something to suit. If you're not lucky enough to live near one of the stores, fear not - the online shop is brilliant. Even better, they are currently offering 20% off everything. Let me know how you get on!